The S&P 500 is down 14% since October. The quality of investment-grade corporate bonds has crumbled over the last decade. A bond is considered investment grade if it’s rated between AAA and BBB-. The closer to AAA, the safer the bond. But according to Morgan Stanley, the US has been flooded with BBB-rated bonds. In the last 10 years, the triple-B bond market has exploded from $686 billion to $2.5 trillion. That’s an all-time high. In other words, 50% of the investment-grade bond market now sits on the lowest rung of the investment-grade ladder. And there’s a reason BBB-rated debt is so plentiful. Companies have binged on cheap credit for years. But interest rates are on the rise. And as I’ve recently discussed in The Weekly Profit, this spells trouble for investors. Higher interest rates make investment-grade corporate bonds less attractive. This is especially true for the lower tiers, such as BBB-rated bonds. That’s how the bond market works. Bonds sold today with a higher interest rate make yesterday’s lower-rate bonds lose value. So, higher-rate bonds are a better deal for investors. And that’s bad news for the companies issuing these bonds. In a recession, BBB-rated bonds are the most vulnerable of all investment-grade bonds. 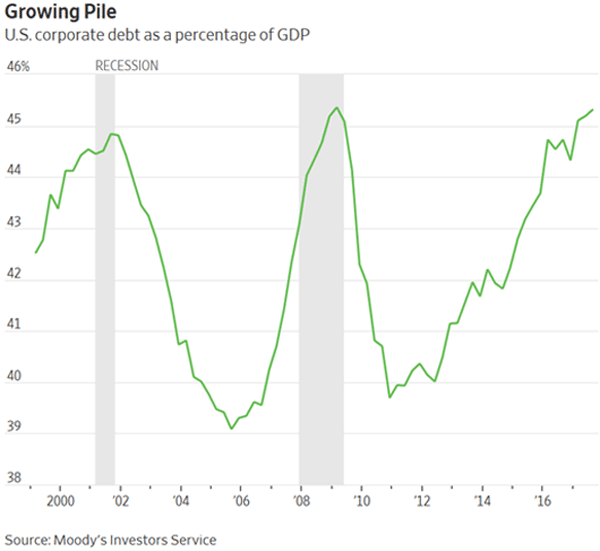 According to Moody’s, 10% of BBB-rated corporate bonds are downgraded to “junk” status in a recession. Since the number of BBB-rated bonds has exploded, we will see more such cases than ever before in the next recession. And when that happens, investors that own a basket of bonds in an index fund will get hurt. When a bond’s rating is slashed from investment-grade to junk, it automatically gets kicked out of any investment-grade indexes. Then passively managed investment-grade bond funds are forced to sell these junk bonds at a huge loss. As a result, the fund’s price crater. We are about to see this happen with General Electric (GE). The struggling company is rated BBB+ by S&P—just two notches above junk status. The stock keeps hitting new lows. So, I expect General Electric will get downgraded to junk in 2019. My goal is to find the safest yields for my readers. Whether it’s dividend-paying stocks, business development companies, or even gold stocks, I want my readers buying the safest investments possible. Today, investment-grade corporate bond ETFs are anything but safe. Of the major investment-grade corporate bond funds, the Vanguard Intermediate-Term Corporate Bond ETF (VCIT) is the riskiest to own. This $18 billion fund yields 3.6% but has a dangerous mix of assets. VCIT has 65% of its assets in bonds rated BBB or lower. If we see a big spike in downgrades to investment-grade bonds, this fund will get hit hard. Next in line is the Invesco BulletShares 2022 Corporate Bond ETF (BSCM). This $1 billion fund yields a low 2.8%, and 49% of its bonds are rated BBB. Even worse, the fund holds three bonds of soon-to-be-junk General Electric. Lastly, we have FlexShares Credit-Scored US Corporate Bond ETF (SKOR). As interest rates rise, I think we’ll see a wave of bond downgrades, and these funds will take the brunt of the downturn. Now is the time to sell these funds before it’s too late.